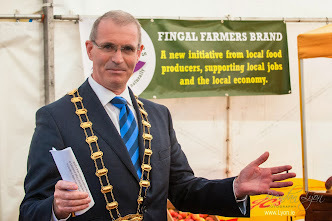 Fine Gael’s Cllr. Eithne Loftus has successfully made representations on behalf of the Residents Association for traffic calming on the main distributor road through Tyrrelstown. 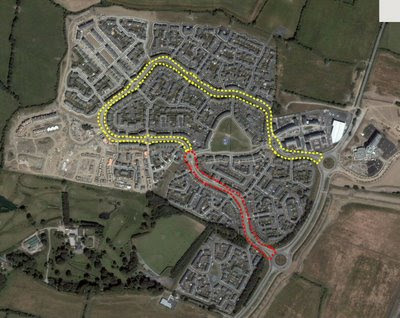 A scheme (outlined in red above)to provide traffic calming measures in the form of 5 sets of speed cushions on this section of the road has been prepared for Bealing Boulevard from Church Road to its junction with the roundabout at Mount Eustace. The scheme will be on public display at the Blanchardstown Offices from Thursday 2nd April, 2009 and written submissions may be made to the County Council up to Wednesday 6th May, 2009. The original planning for Tyrrelstown has as a condition (F99A/1620, condition 21, part 5) that the rest of Boulevard Road be traffic calmed and I have requested the councils building control section to enforce this prior to the road/estates being taken in charge.